Sydney Walters in the backyard of his Vaughan home. Walters’ home is now vacant, and he lives in a rented apartment as the home is now contaminated with mould and inhabitable. Every weekend, Sydney Walters spends hours mowing the lawn, and cleaning up the yard of a home he owns but hasn’t lived in for years. His family fled the semi-detached home in Vaughan four years ago, when mould spread in his home due to the missing insulation in the attic. But he returns to the home every few days, to keep it looking habitable. The Vaughan resident says it breaks his heart when he sees the neighbours near his home on Hollywood Hill Circle sitting on their decks, enjoying the weather and holding barbecues with their families and friends. Sydney Walters pulls a lawn mower over the grass in his Vaughan home’s yard. For Walters, “everything” refers to the home he bought in 2004, in the hopes of giving his family a taste of the suburban dream. But it’s a dream that has become entangled in a web of lawsuits, that Walters says have brought him to the brink of bankruptcy and will soon cost him the only asset he has. 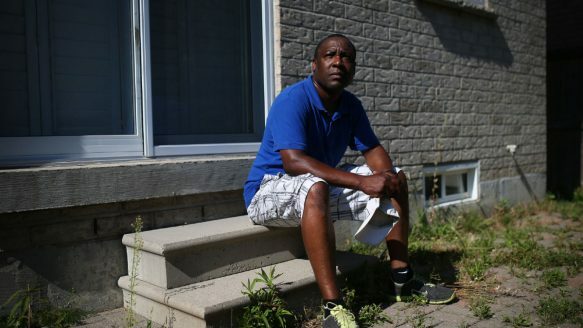 In the meantime, Walters has been living in a cramped one-bedroom basement apartment a street away, with his wife and teenage son — who sleeps on the couch. The burden of paying for and running two households is proving to be just too much. “I’m still paying my mortgage, and we pay almost a thousand dollars to rent this,” said Walters, pointing at the small apartment around him. “Our monthly insurance fee is so high. It’s just a matter of time before the bank will take possession of the house,” he said. The Star profiled Walters in 2012, when he was living in a tent in the backyard of his home because of the mould inside. He had just filed a lawsuit against the city of Vaughan, the builder Villa Royale Homes Inc., and Tarion Warranty Corporation — alleging the parties are responsible for the damage to his home as a result of the bare attic and should be responsible for the costs of the cleanup. In 2013, Walters initiated a new lawsuit against the parties, seeking $2 million in damages to their home and personal injuries. The lawsuit has sparked a handful of others, with the city suing the builder and the builder suing the city, the original homeowners and a subcontractor, who in turn sued the insulation company. With the agreement of all parties, the claims against Tarion and the insulation company were dropped after recent mediation. Since then, the case has hit a standstill as nobody can agree on who is at fault. And each party Walters is suing says the other should pay, if a judge rules in his favour. Court mandated mediation failed in June. Walters’s lawyer, Wendy Greenspoon-Soer, says the case is headed to trial early next year. “Our monthly insurance fee is so high. It’s just a matter of time before the bank will take possession of the house,” Walters said. According to the lawsuit, Walters and his wife Olivia bought the home in 2004 for $320,000 from the original homeowner, who bought the new build in 2002. As first time buyers, Walters admits he was naïve. Because it was only two years old, he moved in without a home inspection. He dutifully paid heating bills — upwards of $400 a month — even though he noticed the home was “extremely hot during summer months and extremely cold during the winter months, with poor ventilation and ice buildup where the walls meet the roof,” according to the suit. In the winter, when he turned up the furnace, heat would escape through the top and melt the snow and cause leaks. In the summer, the house was hot, and the mould began to grow and spread because of the moisture. According to his claim, the family began to have health issues, and specialists and doctors advised Walters and his family to move elsewhere. Even now, he says he enters the home only if he’s wearing protective gear. Walters complained to the city after a contractor he hired said the attic lacked insulation. During legal examination in 2011, notes from a city of Vaughan building inspector confirmed that “no attic ceiling insulation” was ever installed. As a result of the investigation, the city of Vaughan sent Walters and Villa Royale an order to complete the insulation in 2011. In a statement of defence, the city claims any damages should have been rectified by Walters, and that he has “exacerbated their own damages by suing Vaughan rather than fixing the problem.” They also say the damages were caused by the negligence of Villa Royale. Vaughan cites an independent contractor who said the cleanup and repair would cost around $15,000. In the reply to defence, Walters says his house will need to be completely demolished and rebuilt. He blames the builder for not installing the insulation and the city building inspector for failing to ensure it met the Ontario Building Code. Walters said he can’t comment on the offer. Since 2011, Walters says he has gathered documents that try to find answers to how his house was approved, if insulation was never installed. A city document Walters obtained through an Access to Information request show a city inspector approved the home, including its insulation, a day after the house was sold. Normally, a home must pass city inspection before it is cleared for sale. The city did not respond to questions about whether any internal investigation was conducted as a result of Walters’ 2011 complaint, as is required by the building inspector’s code of conduct protocol created in 2005. The city of Vaughan said it could not comment on the matter because it’s before the courts. “Our family, we are living in poverty. We are not poor. We are hard-working people, but we have no money. We go to bed hungry some nights,” said Walters, his eyes wet with tears. “We have a house, but we are living in these substandard conditions,” he said.